He showed the utmost gallantry in approaching his objective. When close to it he killed an enemy officer and captured two snipers. He then rushed two machine-guns, killing or wounding the teams. He subsequently reorganised his platoon in order to capture another position, but after getting within 100 yards of it he was held up by our own barrage, and was obliged to return having sustained nine casualties. Later he again went out with five men to capture the position and when he had gone some distance saw a considerable number of the enemy advancing. He withdrew his detachment man by man, himself being the last to retire, when he was able to report the enemy was forming a counter-attack. By his gallant leadership and utter disregard of danger throughout the attack, he set a splendid example of fearlessness to his men and inspired all with a spirit of emulation which undoubtedly contributed largely to the success of the operations. 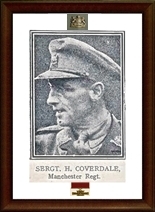 Also received Military Medal 2nd November 1917 and was subsequently promoted to Second Lieutenant. After an intense gas attack a strong enemy patrol endeavoured to rush our posts, the garrisons of which had been overcome. Although badly gassed himself he met the attack single-handed and continued to throw bombs until the arrival of reinforcements, remaining at his post until the enemy’s attacks has been finally driven off. He died from gas poisoning whilst being carried away. It was solely due to his exertions, when his only chance of personal safety lay in remaining motionless, that the enemy was defeated and the line remained intact.